« Gravity Falls: The Complete Series – Honestly, one of the best shows ever. Perfect for binge watching with friends! 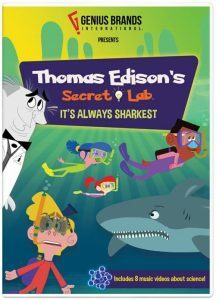 Thomas Edison’s Secret Lab: It’s Always Sharkest is an entertaining DVD that helps children find fun in learning about science related topics. This DVD contains eight episodes. 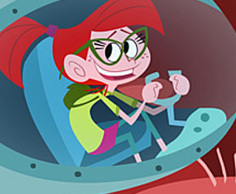 The series follows a group of children who find the famous scientist Thomas Edison’s secret lab, where he built a virtual version of himself as well as a robot named Von Bolt. 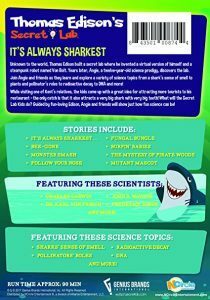 Each episode includes a science related topic that teaches us about things such as DNA or a shark’s sense of smell. I absolutely love the fun songs in this DVD. In each episode, there is a music video at the end of the episode. The songs are very upbeat and usually have a very catchy tune. The songs relate to what is being taught or something that relates to the episode we just watched. The songs bring lots of lightness to the series, which is perfect for a younger audience. The songs definitely will get the kids up and dancing. The animation brings a lot of character to the show. When animated programs have an overwhelming amount of colors and precision detail, it’s difficult for children to focus on what the show is trying to teach. This series has calm, relaxing colors and pretty basic looking characters. I think that helps kids stay focused. Thomas Edison’s Secret Lab: It’s A lways Sharkest is a really good blend of entertaining content mixed with lessons about science. This show is the perfect thing for kids to watch during summer break, because it is entertaining and yet, kids will also learn a lot. I watched this DVD during my summer break and learned a lot from watching it. 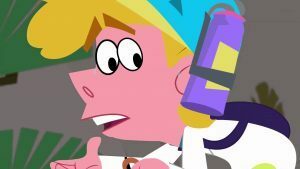 Thomas Edison’s Secret Lab is an animated TV series that teaches science to kids through entertaining episodes that are filled with adventure and fun. Thomas Edison is a hologram and the main characters can talk to him. 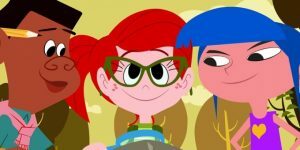 The shows are all about science, but they are also funny and have lots of interesting characters who learn about science or are expert scientists. There is a group of kids named Angie, JD, Kent and Nicky who are the stars of the show. They are kids who are just a little bit older than me and work very well as a team, figuring out problems. In ea ch episode there are different stories and every single one explains how something works. When I watched the shows, I learned how something works or why it happens. The stories taught me a lot and they also have lots of factoids, which I really like. I love factoids! The lessons are very good. I think watching these shows can actually help kids understand what is taught in their science classes in school. The animation is a bit simple compared to other flashy, animated shows. 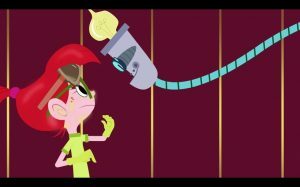 Also there are music videos between the episodes, which I found a little bit bizarre. But, they sort of wrap up the lesson that was taught in the previous episode. This DVD is a collection of epi sodes from the slightly odd TV series, Thomas Edison’s Secret Lab. It includes lots of science, but makes it interesting enough that you are not be bored. It features Thomas Edison as a hologram, a robot called Van Bolt and kids named JD, Angie, Nicky and Kent. In each of the eight episodes, the kids find a problem that seems unsolvable such as when their hamster starts growing rapidly in “Mutant Mascot.” They go through the Virtual Reality Window, which instantly transports them to a scientist who helps them. They usually end up finding a scientific solution. Even though the whole series is built upon facts, the unrealistic parts make for some of the appeal. 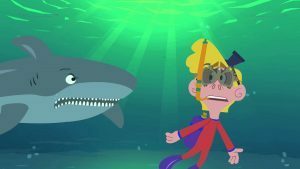 The talking shark in “It’s Always Sharkest” is so amusing that you will not care about the strangeness. The giant slime monster in “Slime Time!” is also fun. The scientific factoids are explained clearly so you will not forget them easily! Unlike actual teachers, the characters do not talking directly to you. I find it easier to learn when I feel “invisible.” Other kids might feel this way as well. This entry was posted on Wednesday, August 1st, 2018 at 3:24 pm and is filed under DVDs Released. You can follow any responses to this entry through the RSS 2.0 feed. Both comments and pings are currently closed.